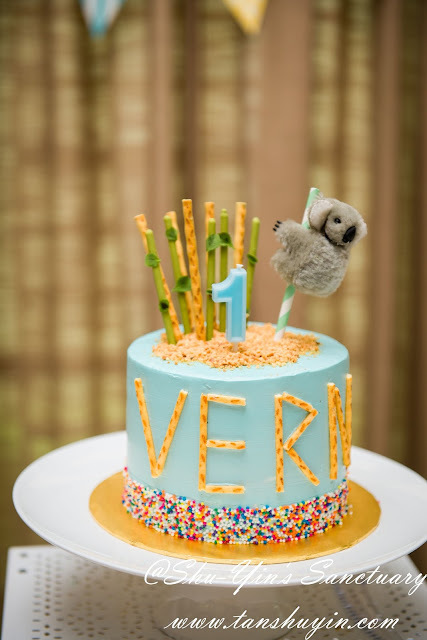 We celebrated Vern's 1st birthday last weekend. And as usual, let's start a post on his birthday cake. I did what I usually do, which was to buy a plain cake and then deco it myself. And this year's theme is Koala (yes, you guess it right. 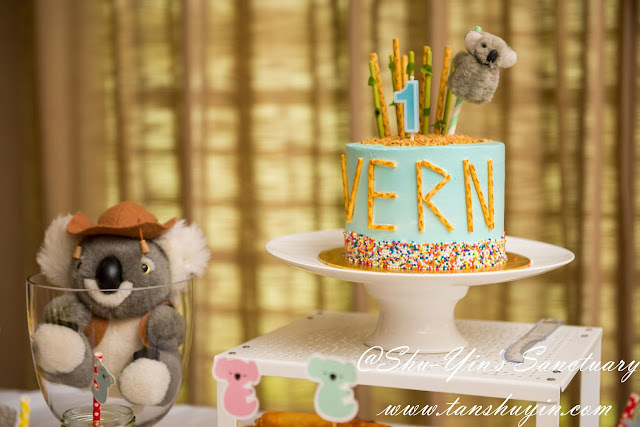 Vern is as clingy as a koala, so a perfect theme it is!). I requested a plain 6" baby blue cake from The After Meal, which was delicious by the way. I'd forgotten to snap a photo of the cake before I decorated it. It came with a pink ribbon. And then I topped the cake with ground peanuts which I bought earlier from the pasar malam ban chang kuih seller. And then I was cracking my head to see what could I do to make it resembles plants more, and so I went out in my garden and plucked some mini leaves from one of my plants and then suick the leaves on the sticks with some melted Kit Kats! 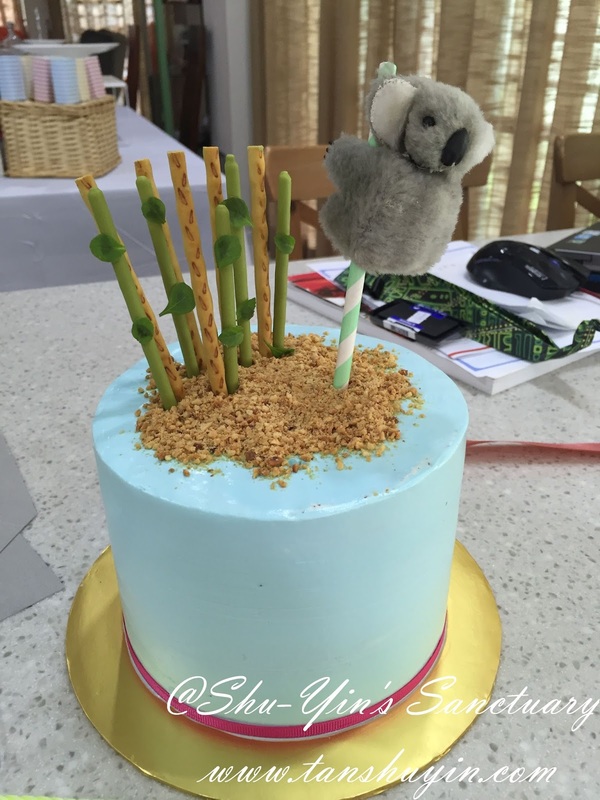 And of course it needed a Koala on a Koala-theme cake, right? And so there it was, a Koala clinging on to a green and white paper straw! 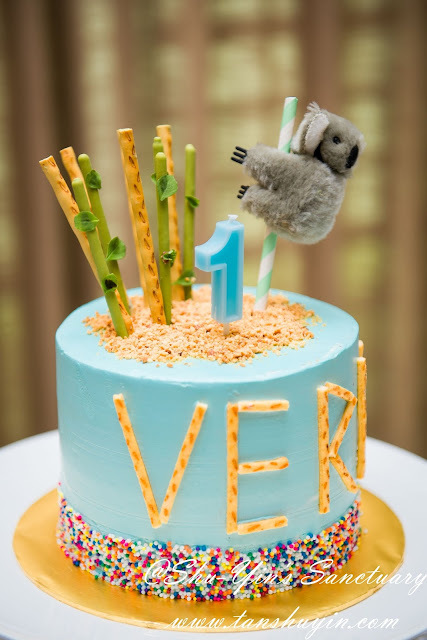 And then I decided that the cake was too tall and plain on the sides, and so with the same pretzel sticks, I formed the name V E R N on it. And at the very last minute, I took out the ribbon and sprinkled the bottom with colourful sprinkles. And then topped with the baby blue "1" candle. 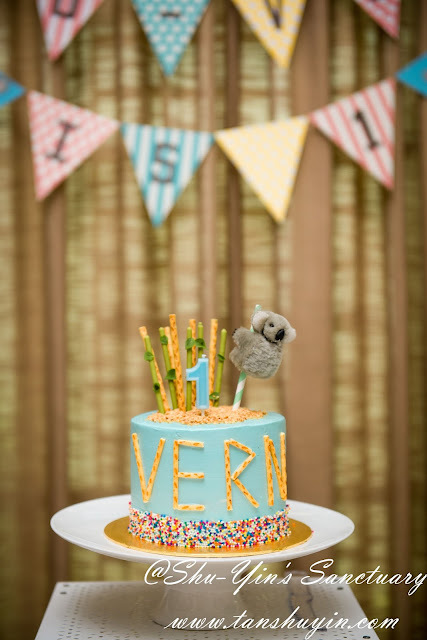 Tada.....a very awesome one-of-a-kind Koala 1st Birthday Cake for Vern! Even if you are not a baker, or you are not a fan of fondant cakes like me, then this is for you. It is fun, economical, one-of-a-kind and awesome to transform a plain cake into something nice and meaningful and according to the theme. 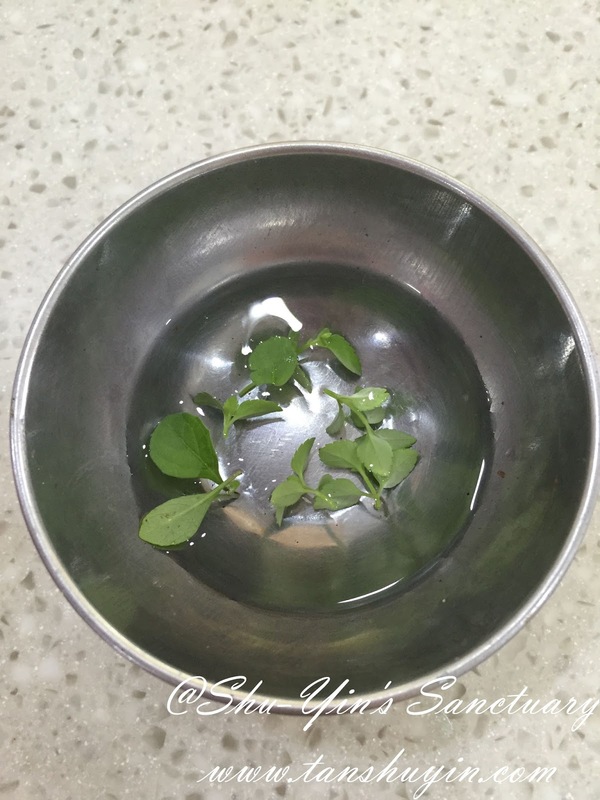 Please click below for more inspirations on how I decorated my kids birthday cakes throughout the years. (Click to view Shern's 1st, 2nd, 3rd and 4th, 5th, 6th & 7th birthday cakes).